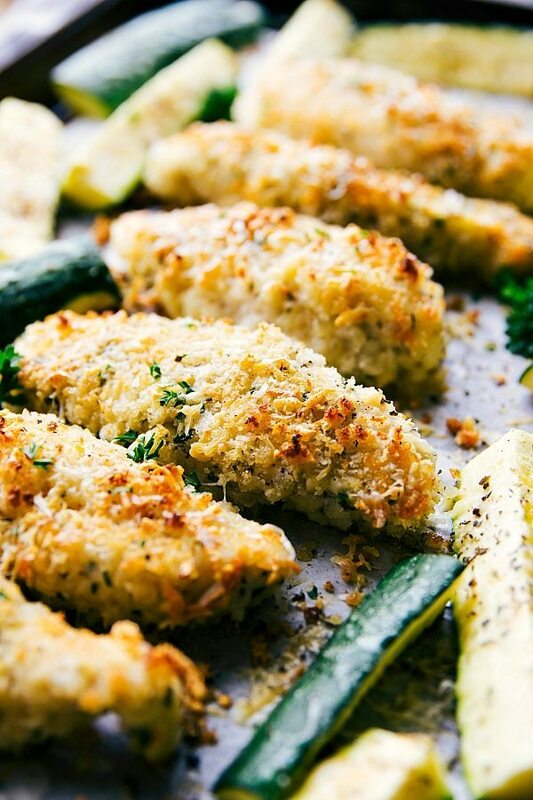 A delicious garlic parmesan chicken dinner with zucchini made on one pan! 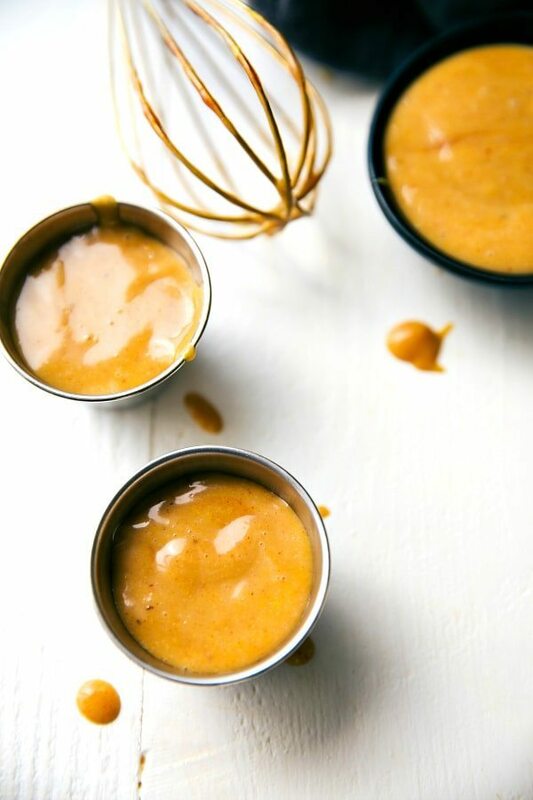 And the best 3-ingredient sauce to coat or dip the chicken in! I’m not too sure why I’m all over the summer/warm weather recipes right now because it has been crazy weather lately here in Utah. I should be sharing about 10 more soup recipes and 1-2 more hot cocoa ones. We went with our friends to the Thanksgiving Point Gardens’ famous tulip festival last week and were completely stormed out. It was drizzling rain so we decided to venture out a bit but right when made it to the middle of the gardens we got caught in a crazy hailstorm. Bentley was put in my friend’s stroller and Grey was clinging on to me as we ran for cover. We made it to a covered concession stand and just watched as tons and tons of hail shot down. As we were running for cover, Grey was pretty upset about the hail hitting him. He kept yelling at it to stop and when it didn’t listen to him he was begging me to ask it to stop. You know, because I have magical weather-changing abilities and all ?? His hailstorm injuries ended up to be nothing a good sized bag of popcorn couldn’t fix as we huddled under the concession stand. And then I went home and cooked zucchini with chicken and pretended it was summer-time. Because what else do you do in a crazy hail/snow/RIDICULOUS-weather-in-May storm?! 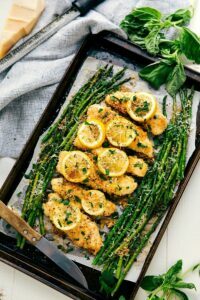 This one pan lemon parmesan chicken + asparagus has been such a big hit (with my family and with all of you!) 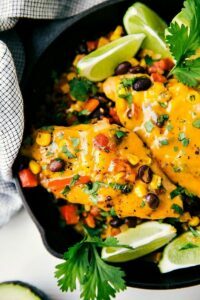 that I’ve been dying to share another twist on one pan chicken veggie dinners. And this one is geared towards summer eating with ZUCCHINI. And perhaps the yummiest sauce you might ever eat. That happens to only be 3 ingredients. ? And 3 simple ingredients at that: coleslaw dressing, yellow mustard, & honey BBQ sauce. Truth: amazing things happen when you mix those three ingredients together. The rest of the recipe mimics the ease of the sauce: few ingredients + simple. 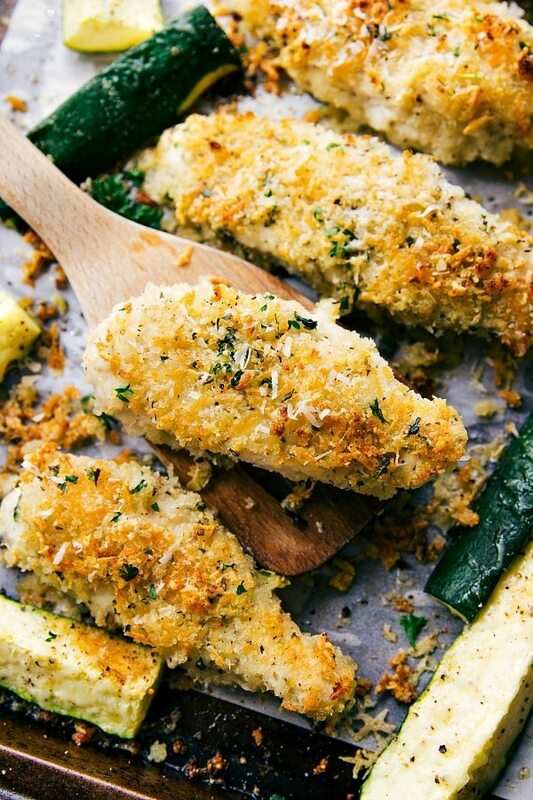 The chicken gets a light breading in a Parmesan cheese (use freshly grated for WOW) + Panko + herb mixture and then baked. 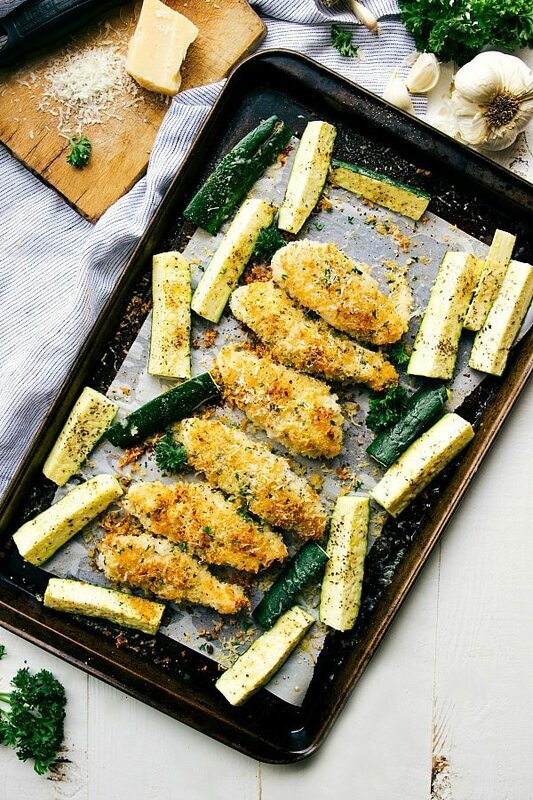 Remove it about halfway and add the zucchinis (or another vegetable that will cook in about 10-15 minutes) with their own Parmesan + herb mixture. Return to the oven and before you know it — mega delicious dinner is ready to be served! Grab three bowls. Add the flour to one bowl with about a 1/2 teaspoon salt and 1/4 teaspoon pepper. Stir. Combine panko, 1 cup freshly grated parmesan cheese, 1 teaspoon garlic powder, dried parsley, &1/2 teaspoon Italian seasoning. Stir. In the final bowl, add 1/3 cup olive oil with 1/2 to 1 full tablespoon garlic (depending on desired strength of garlic flavor.) Stir. Coat in flour mixture, dredge in the olive oil mixture, and then heavily coat in the Parmesan panko mixture. Place on prepared sheet pan. Use any remaining Parmesan panko mixture and press into the tenders. Meanwhile, slice the zucchinis into small quarters as seen in the photos (or video above recipe). 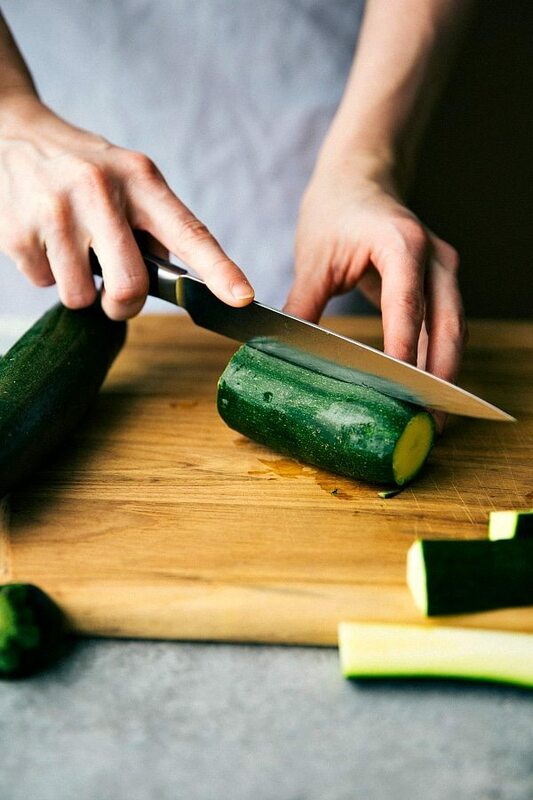 Toss the zucchini with the remaining 2 tablespoons olive oil. Combine the remaining 1/4 cup parmesan cheese, remaining 1/4 teaspoon garlic powder, remaining 1/2 teaspoon Italian seasoning, and dried basil if desired. Add a pinch of seasoned salt and pepper. Place the zucchini pieces around the chicken pieces on the pan. Top the zucchinis with the Parmesan and herb mixture. Return to the oven and bake for another 10-15 minutes or until the internal temperature of the chicken has reached 165 degrees F.
Meanwhile, whisk together the 3 sauce ingredients. Love one pan dinners? Try these next! This looks so delicious! My only question is, what is coleslaw dressing? Thanks! They are generally found in the produce section with other refrigerated dressings and dips. Thank you! I made this tonight and it was a hit. My husband is usually weary of squash of any variety but he ate most of it himself! Also, big fans on the chick fil a sauce. Yikes about the hail! Glad you found cover! This dish looks amazing, I can’t wait for the weather to finally get warm (no hail/snow, please!) and to harvest some zucchinis… I’ll definitely be making this! I love this recipe idea with the Italian seasoning. Great finger foods to promote self feeding for the little ones too. 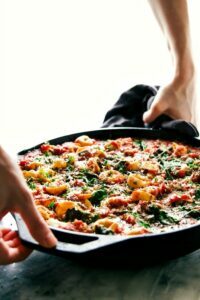 Love love love one pan dinners, especially when they look as delicious as this one! And what a perfect way to combat the crazy weather. This looks great! A miracle happened at dinner tonight, everyone loved it! This was a huge hit with both my kids and my picky husband. They asked where I got the receipe and after a said a blog my 9 year old son said get more receives from that blog! ? Thanks for yummy new dinner in our rotation. This was one of the best, tastiest dishes I’ve made! I served mine over pasta and sauce. Thanks! I’m so thrilled you enjoyed this so much Nicole! 🙂 Thank you so much for the comment! I just wanted to say when I made this the chicken was not crispy. I followed the recipe. I don’t know what went wrong. It tasted good, just kind of mushy . I feel like it’s a lot of olive oil. Hmm we’ve never had the chicken be mushy. Did you separate the olive oil and only use 1/3 cup? Also did you use Panko? If you try this again, you can try to shake the chicken off after dredging it in olive oil and try putting it under the broiler for a few minutes to really crisp it up. I made this last night and it was delicious, left overs went to my husband for lunch the next day! Would defiantly recommend this recipe! 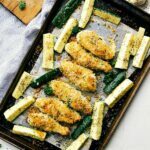 I am very excited to make this recipe tonight I was innitally planning on making the garlic parm such and chicken tenderloins in a seperate dishes but once I seen this all in one pan and read the recipe I was stoked to try it out!! This was DELICIOUS! I had to use the broiler for a few extra minutes at the end to crisp up the outside of the chicken. I also seasoned the chicken a little with salt & pepper before I coated it. Everyone loved it- Will be making this again for sure! The dipping sauce was AMAZING. Thanks for sharing! !